This section provides a quick introduction of Issac Newton and his main contribution to physics, Newton's Laws of Motion. Who Is Newton? 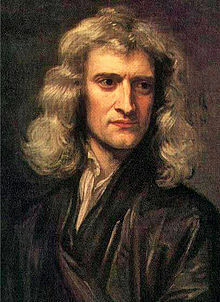 Newton, full name Isaac Newton, was an English physicist and mathematician. He was born on December 25, 1642, at Woolsthorpe, England, and die on March 31, 1727 at London, England. Newton's First Law of Motion - If the net force acting on an object is zero, then the velocity of the object is constant. Newton's Second Law of Motion - The acceleration of an object is directly proportional to the net force acting on the object, and inversely proportional to the mass of the object. Newton's Third Law of Motion - If a force is exerted by one object to another object, another force is simultaneously exerted by the second object to the first object with equal strength and opposite direction.